It’s a wager gone terribly wrong. Rich savvy investors, who invested in real estate debt funds expecting higher yields and capital protection, are spending sleepless nights as they have not been receiving regular interest payments over the past year. Some of these investments may go down the sewer unless there is an immediate uptick in property sales and a resultant revival in the real estate sector, wealth managers and analysts opine. Ballpark estimates suggest that almost half of the 50-odd real estate funds – which provide mezzanine funding to developers – have turned irregular in their interest payments, which on a normal course are paid every quarter or in two instalments every year. “Some of the NCD issuers – and real estate funds that have invested in NCDs – are seeing delays in interest payments and probable defaults,” said Prateek Pant, executive director – products & services, RBS Private Banking. “There’s clearly a lot of liquidity stress in the real estate market. HNIs who have direct investments in NCDs are now grappling with irregular interest payments,” Pan added. Payment delays apart, several funds have also marked down coupon rates and extended principal repayment schedules by almost 12 to 24 months. Most funds have a one-year moratorium immediately after the launch, during which period it is not obliged to make any pay-backs. From the second year onwards, funds start repaying interests every quarter, along with some principal amount. As the years progress, the portion of principal repayment goes up. “A handful of debt oriented RE funds has also faced delayed payments from builders and exits have been slower than estimated impacting investor returns,” said Sriram Iyer, CEO of Religare Wealth Management. “While all of this lending is backed by collateral in the form of land or building and in some cases, personal guarantees, funds have not resorted to liquidation of collateral which in itself may not be an easy option to exercise,” Iyer added. It’s not only small funds, but a few from larger pools — managed by the likes of HDFC, Birla Sunlife, JM, ICICI Pru, Kotak, IIFL, Edelweiss, Indiabulls, DHFL, ASK Group and Edelweiss — have also tweaked payment schedules, sources said. “The smaller funds – with asset exposure in the range of Rs 50 – 100 crore – are staring at payout stress,” said Shouvik Purkayastha, MD – capital markets group, Cushman & Wakefield. “Some have frozen their coupons because of low cash-flows. But unless there’s an actual default, there’s good probability of money coming back to investors, albeit a bit delayed and a bit lower returns than promised by these funds,” Purkayastha added. Real estate funds moved on from being pure equity play (where they participated in projects) to mezzanine debt funding a few years ago as yields hovered between 18 and 24 per cent per annum. To secure their money, funds gathered 2 – 4 times collateral and tagged along ‘desra’ clauses which took care of immediate payout to investors. Long term payouts, however, are dependent on developer cash flows. India’s real estate sector has been witnessing weakness in sales momentum, rising inventory and debt levels for the past three years. As per the latest data, unsold housing stock across top eight property markets in the country rose 18 per cent to over 1.1 billion sq ft as on June 30. Barring Hyderabad, all other cities have shown a rise in the unsold inventory, with Bengaluru showing maximum increase of 55 per cent compared to a year ago. Though the growth in unsold stock in the National Capital Region has been just 7 per cent, the region tops the chart with 326 million sq ft, followed by Mumbai Metropolitan Region at 201 million sq ft. Last month, Moody’s Investors Service said that India’s bigger property developers will continue to face a challenging operating environment including weak cash flows, flat sales and stagnant prices over the next one year. According to analysts, funds deployed between 2010 and 2012 are phasing through a lot of stress. Project cash-flows have also declined significantly as there’s limited consumer interest at the aggregate industry level, analysts opine. “While commercial real estate is showing some improvement mainly because of low supply, residential property sales velocity has fallen sharply. This is impacting payouts of most mezzanine funds,” Abrol added. 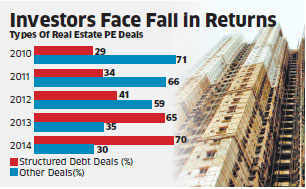 It’s not only real estate debt funds, but also rental yield funds that are facing sectoral headwinds. Tepid demand for commercial real estate has flattened rental yields; several funds operating in this space have not exercised escalation clauses which allow them to charge a higher rent after a specific time-period. Rental yield funds are returning 7 – 9 per cent PA – about 11 – 13 per cent lower than the promised yields. “Overall performance of rental yield funds has been sub-par,” said Atul Singh, MD & CEO, India of Julius Baer. But rather than reducing prices outright to drive sales volumes, developers are modifying products configuration and offering incentives to prop up sales momentum.